ABC7 News sat down with astronaut Buzz Aldrin on Friday for an interview in which the American hero admits to doing more than walking on the moon. SAN FRANCISCO (KGO) -- There's a bonafide American hero in town. 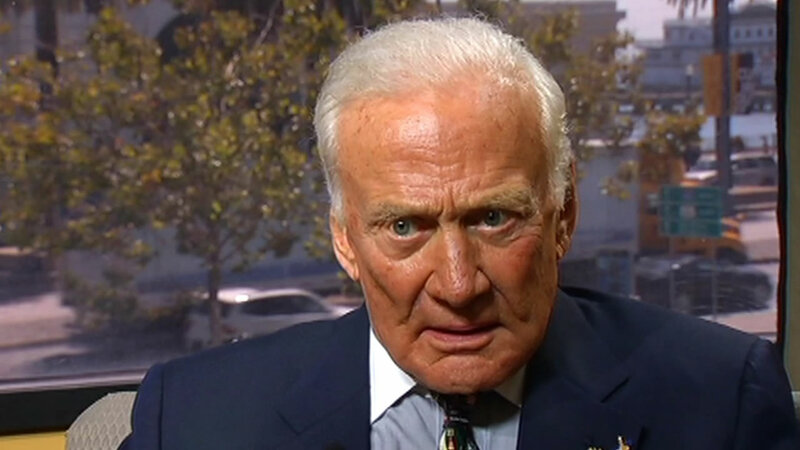 ABC7 News sat down with astronaut Buzz Aldrin on Friday for an interview. Forty-five years ago this week, Aldrin followed Neil Armstrong onto the lunar surface by only a few seconds after the first lunar landing. He's never sought lasting fame, but has lived with it every day since. "What I want to make clear is that 24 Americans went to the moon," Aldrin said. In an interview with ABC7 News reporter Wayne Freedman, Buzz Aldrin shared something you might now know about his walk on the moon. "I did not care for giving speeches and particularly being in a situation that would call a lot of attention to me," he said. Now it's different as he urges international landings on asteroids and a permanent colony on Mars. Those goals are as reachable now, Aldrin said, as when Americans first set out for the moon. Aldrin estimated that Apollo 11 had only a 60 percent chance of success, though he said he wasn't nervous. "Fighter pilots in combat, we don't feel. We execute. It is said we have ice in our veins," he said. There was no way he or Armstrong would let emotions cloud their performance. "You're on the merry-go-round. You can't get off," he said. Yet there he was, on a relatively crowded moon at the time -- population two. If anyone has ever wondered whether Aldrin ever took a moment for himself, his answer is surprising. "So I got down to the bottom of the ladder and instead of checking my balance and stuff like that, the checklist said I tested the urine collection device," he said. It was the first time he used it. Until now, most Americans have only heard about the planting of the flag. Aldrin will be on the U.S.S. Hornet in Alameda on Saturday, celebrating its role in the recovery after Apollo 11.